Tuesday, August 1st from 7pm – 9pm at Cutler Ridge Park. This is your chance to ask questions, make complaints, give compliments, or make suggestions to the town council and staff. It's a great time to speak out on issues important to you and your neighbors. Don't miss this opportunity! For more information, see the flyer. August 4 – 6th. It's almost time for school to begin, and here's your chance to save. The State of Florida's Back to School Tax Free Holiday takes place from August 4th through August 6th. Save on school supplies, clothing, shoes, and personal computers. To find out more, visit this publication and the FAQs. August 7th, at 7pm at town hall. For quite some time, Cutler Bay has been working towards getting a canoe/kayak launch at Lakes by the Bay Park. On August 24th, the town will hold the first of four public involvement meetings to discuss these plans and get input from the public. The proposed project consists of the launch, a park shelter, pedestrian walkway, lighting and parking. See the flyer for more information and additional meeting dates. Kmart in Southland mall is closing. The store is expected to be closed by early October. Some stores liquidation sales will begin as early as July 13. See the full list of store closings. A new addition to Whispering Pines Park, a butterfly garden in memory of Louise Lockwood. Louise advocated to make Whispering Pines Park into what it is today. She started the 4th of July Parade and along with the Whispering Pines Civic association and Women's Club (both of which she was a member) it has become one of our towns signature events, She worked for the incorporation of the town, served on the town's parks committee and education committee. She was a teacher, a patriot, and a friend. Louise passed away last year but her hard work and dedication lives on. A new restaurant is opening in Cutler Bay! Xochimex Cantina Grill is coming to the Old Cutler Towne Center. This new restaurant is similar to Moe's and Chipotle Mexican Grill, featuring tacos, burritos, quesadilla, rice bowls, and desserts. See their website at xochimexcantinagrill.com. Saturday, July 29, 2017 at 9:00 a.m. Girls ages 5 to 17, come out for some fun activities to introduce the sport or to improve existing skills. This clinic is geared towards players of all levels. PBSA Coaches will cover conditioning, hitting, fielding, pitching, catching, team play, and more. What to Bring/Wear: active wear, sneakers or cleats, softball glove, helmet, softball bat (optional), water bottle(s) and sunscreen. Catchers should bring their own gear. For more information, visit pbsa.siplay.com. Saturday, July 29th from 10am – 2pm at Cutler Ridge Park. Come out for an afternoon of music, games, burgers, and lots of wet fun including a water slide. Admission is free, and food is complimentary, just bring proper swim wear, a towel, and lots of sunscreen. The park is located at 10100 SW 200th Street. See the flyer for more information. The Deering Estate will offer $1.00 admission to the park on Sunday, July 16th, from 10am - 4pm. There will be lots of activities, a tropical fruit display, the Zoo Squad, along with other activities for an additional fee such as canoe tours, and a rain barrel workshop (pre-registration required). Registration is now open for the 4th Annual Cutler Bay Senior Games. Residents 50 and over can qualify to compete in a variety of events. See the flyer and registration form for more information. Congratulations to Cutler Bay resident, Steve Zarzecki, who went on to win two silver metals in the national games. Saturday, July 1st and Sunday July 2nd, from 9:30am-4:30pm. Fairchild Garden presents their International Mango Festival. The event features tree sales, lectures, cooking demonstrations, bite-sized samples, a beer garden, activities for kids and more. For more information, visit their website. July 1st -4th from 10am – 5pm. Visit Zoo Miami for the reduced price of just $10.00 per person. Visit zoomiami.org/10Days for more information. July 4th from 9am – noon. Come celebrate Independence Day with an old fashioned parade and picnic with hamburgers, hot dogs, and snow cones along with a super slide and bounce house for the kids. Registration for the parade begins at 8:15. Decorate your bike, truck, car, golf cart and even your dog and join the fun. Live music will be provided by Cutler Stew. This yearly event began 50 years ago when Louise Lockwood suggested neighborhood kids decorate their bikes and parade around the lake. Louise along with the Whispering Pines Civic Association and Woman’s club continued the yearly celebration as it grew into a town wide event with music, food, and entertainment. Louise passed away last year, but her legacy of patriotism and advocacy for her community lives on. Saturday, July 8th. Although it doesn't take place until July 8th, Cutler Bay's Golf Tournament is always a popular event. Limited to just 100 players, all interested players are encouraged to sign up and pay asap. This years event will take place at the Deering Bay Yacht & Country Club. For more information see the flyer. June 25th from 7am – 10am. Come to Zoo Miami for breakfast and fishing to remove invasive fish from their lake. Full day admission is included with registration. Cost is $50.00. Visit zoomiami.org for more information. Do you want to sign your child up for summer camp at Cutler Ridge Park? Registration is now open for kids ages 6-12. Children will enjoy a host of camp activities along with field trips to places such as Zoo Miami, Paradise Cove, Sky Zone, and more over the course of the summer. For more information, see the registration form. 1. Town manager report on potential land acquisitions. 2. Proposed butterfly garden in honor of Louise Lockwood. 3. Authorizing design services for a canoe launch at Lakes by the Bay Park. For other items of interest, read the full agenda. The meeting takes place on May 17th at 7pm at town hall, located at 10720 Caribbean Blvd. May 19th, 20th, and 21st. Visit the Redlands Fruit & Spice Park for one of the largest annual orchid shows in the U.S. The event features over 50 booths with educational exhibits and vendors, along with lectures, raffles and international food. Admission is $10. For more information, visit redlandorchidfest.org. The park is located at 24801 SW 187th Ave., in Homestead. Saturday, May 20th from 11am - 3pm. Spend a few hours showing your support for those who serve in our armed forces. This town event will include displays and demonstrations, Home Depot kids workshop, inflatable obstacle course, food trucks, fly over , and free snow cones, popcorn, and cotton candy. The event takes place on at Lakes by the Bay Park. 8551 SW 216th Street. See the flyer for more inofrmation. Friday, May 12th at 7pm. Bring the kids to Bel-Aire Park for a free showing of the Disney movie "Moana". Bring you lawn chairs and blankets. Food and popcorn will be available. Bel-Aire Park is located on Franjo Rd at 185th Street. See the flyer for more information. May 14th, 11am – 1pm or 2pm – 4pm. Celebrate Mother's Day with a champagne Bay Cruise on Biscayne Bay. Tickets go fast so get them early. Visit deeringestate.org/mothers-day for more information and to buy tickets. Tuesday, May 2nd at 7pm. The Concerned Citizens will feature Eduardo Varona as their guest speaker this month. Mr. Varona will discuss the status and progress of both the wetlands restoration and the future of the uplands portion of the vacant land on Old Cutler Road at SW 184th Street. With an important Town Council hearing coming soon, this is an important meeting regarding the preservation of our quality of life here in Cutler Bay. The meeting takes place at Cornerstone Church, 18301 S Dixie Highway, in Palmetto Bay. May 4th at noon. The Town of Cutler Bay will hold a service to mark the National Day of Prayer. The event takes place at the Center Courtyard of Town Hall, 10720 Caribbean Blvd. See the flyer for more information. Saturday, May 6th and Sunday, May 7th from 8:30am - 2:30pm. Join us in helping to restore a beautiful Pine Rockland, Hammock, and Coastal Wetlands area. The property is located on SW 184th Street, east of Old Cutler Road (entrance to the Palmetto Bay Village Center). Volunteers will help plant plants, mulch, and weed. Depending on time and water levels, tours will be provided of some of the restored coastal wetlands. Find out more at facebook.com/livablecutler. Saturday, May 6th from 7-11pm. Visit the zoo for a chance to sample beer and spirits from around the globe. Enjoy great food and a Live performance by Patrick & the Swayzees. Visit newtimesbrewatthezoo.com for advance tickets and more information. Tuesday, May 9th, from 9am - 11am. Trained professionals will lead older drivers through a 12-point checklist and recommend adjustments to make their cars fit them better. The event takes place in the Town Hall parking lot, located at 10720 Caribbean Blvd. For more information, see the flyer. Friday, April 21st at 7pm and 9:30pm. Attend the funniest show in town with headliner Dana Eagle at Thalatta Estate. Seating is first come first serve. Don’t forget to bring your own food and beverages as no refreshments will be sold. Find out more at this website. Friday, April 21st from 6 - 10pm. Come to Cutler Ridge Park for Cutler Bay's new monthly event "Bite Nite". This food truck event takes place on the third Friday of every month at Cutler Ridge Park. Enjoy free music and entertainment. Visit our Facebook page for the flyer and additional information. Saturday, April 22nd from 10am – noon. The town will hold a tree planting in recognition of Earth Day and Arbor day at Saga Bay Park. Along with the planting, there will also be guest speakers. The park is located at SW 205th Street and 80th Ave.(map). For additional information about our community parks, visit our parks page. April 22nd, from 10am – 6pm, enjoy blues and country music, great BBQ food, and childrens activities including pony rides at the Fruit and Spice Park. Admission is $8.00 (free for children 11 and under). The park is located at 24801 SW 187th Ave., in Homestead. Visit their website for more information. Saturday, April 22nd from 7 - 11pm. The Tropical Audubon Society will hold their 7th Annual Birdstock Concert benefiting improvements to the Doc Thomas house. The event includes preformances by six different bands, Mr. Good Stuff’s food truck, craft beer, a silent auction, and more. For more information, visit the Facebook event post. Saturday, April 22nd is clean up day, when thousands of volunteers work to clean up our shoreline. You too can show your love of the environment by registering to help. Registration is now open. Visit the Baynanza website to register and get more information about the event. Sunday, April 23rd from noon to 4pm. This Earth Day event includes workshops, food demonstrations, plant sales and activities, green vendors, wild life shows, crafts for kids, lady bug releases and more. Admission is FREE. Visit pinecrestgardens.org for more information. The weather is beautiful, Don't forget to take advantage of it by visiting our National Parks for free on the weekend of April 22nd and 23rd. Visit nps.gov for more information. Monday, April 24th from 7 – 9pm. Cutler Bay residents will have the opportunity to ask questions and discuss items of concern with the town manager at the town's open mic night. The meeting takes place at Cutler Bay Town Hall, located at 10720 Caribbean Blvd. See the flyer for more information. Friday, April 28th at 8pm. Pinecrest Gardens presents the fun-filled family movie, “Finding Dory”. It’s an evening of fun with garden tours and snacks. The cost is just $5.00 per person. Find out more at their website. Saturday, April 8th from 10am-5pm. With over 50,000 eggs this fun filled hunt includes prizes, face painting, music, arts and crafts, balloon art, interactive games, story-telling, a petting zoo, and delicious food. Admission is $5.00 in advance or $7.00 at the gate. See their website for advanced sale information and schedule of egg hunts (categorized by age). Friday, April 14th at 8pm. Bring the kids to a showing of the movie “Zootopia” at Pinecrest Gardens. The fun begins with a stroll through the gardens, then indulge in fresh popcorn, soft drinks, hot dogs and more. Find out more at pinecrestgardens.org. Saturday, April 1st from 10am until noon. Bring your children, 9 and under, to Cutler Bay’s annual Easter Egg Hunt. Take a picture of your child with the Easter Bunny, enjoy music, games for the kids, a bounce house, face painting and balloons. See the flyer for more information. Beginning the first week in March. The town has just announced that beginning the first week in March, traffic on Caribbean Blvd will be limited to one westbound lane, and eastbound traffic will be detoured. This change in traffic pattern is expected to last for 4 months. Expect delays and plan ahead. http://cutlerbay-fl.gov/home/showdocument id=9141 The town will hold an informational meeting about the project on Thursday, Feb. 16th at 7pm at town hall. Saturday, March 25th, 8pm at the South Miami Dade Cultural Arts Center. Sample local brews and spirits while listening to the tunes of the New Orleans-style, world-famous Dirty Dozen Brass Band and Funky Meters. The Town of Cutler Bay has arranged for discounted $5 tickets. To purchase tickets, visit SMDCAC.org and use coupon code “CBBAM”. For more information, see the flyer. Sunday, March 26th from 10am-6pm. Savor delectable fresh seafood at the Deering Estate's 13th annual Seafood Festival on the Bay. This event features food, entertainment, scenic boat rides, celebrity cooking demonstrations, and an exciting Kids Zone. Admission is $25 for adults ($15 if purchased in advance on-line) and $5.00 for Children ages 4-14. The event takes place at the Deering Estate, located at 16701 SW 72nd Ave. For more information or to purchase discount tickets in advance, call 305-235-1668 ext. 263, or visit their website. March 11th, from 2-6pm at Cutler Ridge Park. Come to the 2nd Annual Wings Over the Bay, Chicken Wing Cook-off, with a competition fo the best bufallo, special grill, and parmesian garlic wings. There will also be live music, food trucks, and a wing eating contest. Join the fun! Friday, March 17th from 6-10pm at Cutler Ridge Park. Get ready for "Bite Nite", Cutler Bay's food truck festival. Friday, March 3rd from 10:30 - 11:30 am. Here's your chance to attend a free showing of Carnival of the Animals by the Miami City Ballet. This full-length ballet features over 40 dancers. The event takes place on at the South Miami Dade Cultural Arts Center. This free showing is for Cutler Bay residents. To attend, you must RSVP by Thursday, February 24th to Janelle Marzouka at jmarzouka@cutlerbay-fl.gov or phone 305-238-4166. See the flyer for more information. Saturday, February 25th, at 3pm. Here's a special offer you don't want to miss. Tickets for the Peking Acrobats at the South Dade Cultural Arts Center are reduced to $5.00 each for Cutler Bay Residents. Use Promo Code CBPA16 at checkout. See the flyer and a short video of their performance. Friday, Feb. 10th from 6-11pm, Saturday, Feb. 11th from 1-11pm, and Sunday, Feb. 12th from 1-10pm. Don’t miss this yearly carnival with carnival rides, food trucks, live bands and more. The fun takes place at 18455 Franjo Road. Find out more at hrsrcarnival.com. February 13th (6pm) zoning hearing agenda at the Palmetto Bay Village Hall. A site plan for a potential new apartment/condo building is being proposed for Palmetto Bay, at US-1 and 183rd Street. This is where Perrine-Peters Church is now located. It appears that the plan is for an 8 story, 301 unit complex. (Note: We do not have our own copies of the plan, so we could not verify these numbers.) Additionally the Village Council will consider approving a site plan for a new fire rescue facility at 18198 Old Cutler Road in Palmetto Bay. Read the meeting agenda at http://bit.ly/2lxSo77. Go to our Facebook page to see the artist renderings or to comment. Monday, February 13th at 6pm. The town will hold a Public Involvement Visioning Session asking for ideas to "create a healthier and more sustainable living environment for our town". The meeting will take place at Town Hall – 10720 Caribbean Blvd. See the flyer for more information. February 14th, 8pm (Gates open at 7pm). Moonlight and music create the perfect Valentine's Day event at the Deering Estate. This years concert features Chloe Dolandis and Alejandro Elizondo. Gates open at 7pm. Food is available for an additional fee. Find out more or purchase tickets by visiting deeringestate.org. Palmer Trinity School had the grand opening of their 184th Street entrance this morning. Students, staff, and visitors will begin using the entrance beginning Monday morning. If you travel on 184th Street expect delays, especially during this period of transition. More information at Facebook.com/CutlerBayNews. If you missed the State of the Town Address, Here is the video that was shown. At the January 3rd Concerned Citizens meeting, District 8 Commissioner Daniella Levine Cava gave an update on recent legislation and things happening in our community. Residents can subscribe to her newsletter to stay informed on issues of interest in our District. According to Palmetto Bay Mayor Eugene Flinn, Palmer Trinity School's new entrance on 184th Street is expected to open in mid-February. He notes that the school "has indicated that all school buses, staff, delivery trucks and student drivers will be restricted to this entrance only." Palmer Trinity's website reports that the "Civil engineering work on-site is 65% complete." To see a video overview of the project, visit palmertrininty.org. Tuesday, February 7th, 7pm. 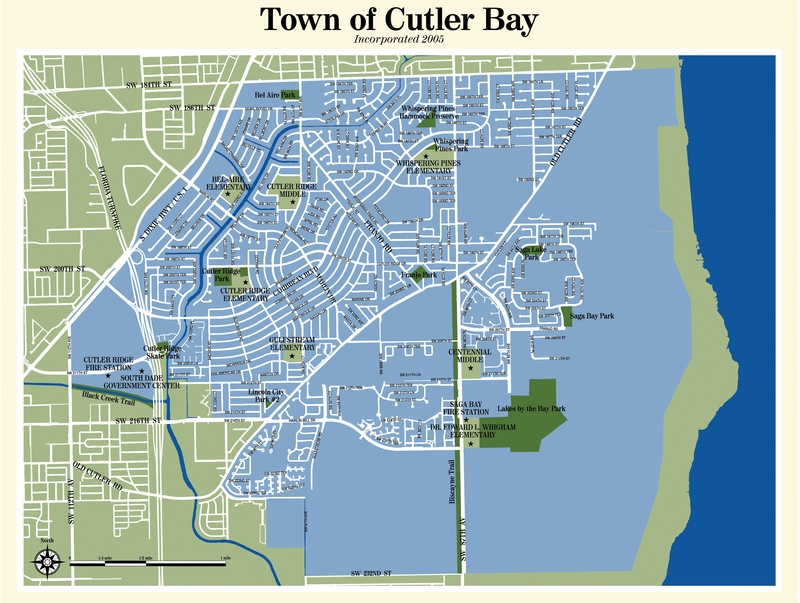 The Concerned Citizens of Cutler Bay will join with the town to present the second Public Involvement Meeting regarding the “Complete Streets Corridor Analysis”. Roads being looked at for improvements include: SW 97 Avenue, Franjo Road, Gulfstream Road, Marlin Road, and SW 87 Avenue. NOTE; The meetings take place at Cornerstone United Methodist Church 18301 South Dixie Hwy. Palmetto Bay. See the flyer for more information. You can also visit the Concerned Citizens new facebook page. 150 Foot Monopole Proposed For SW 87th Ave.
January 26th, 9:30 am. The County will hold a zoning hearing to decide on whether or not to allow the fire department to install a 150 ft. monopole at their fire station located on 87th Ave., next to Whigham Elementary School and Lakes by the Bay Park. On January 23rd at 7pm, a public meeting with representatives of the fire department will be held at Cutler Bay Town Hall. To read or comment about this issue, visit our post on Facebook. January 20th and 21st at 8pm and January 22nd at 7:30 pm. Some of the best things in life are FREE. Shakespeare Miami will be presenting "The Merchant of Venice" at Pinecrest Gardens. Find out more at shakespearemiami.com/the-merchant-of-venice. Friday January 20th through Sunday, January 22th, from 9:30am until 4:30pm. This great event will feature chocolate treats, cooking demonstrations, informative lectures, and more. The event takes place at Fairchild Tropical Garden, located at 10901 Old Cutler Rd. For more information and for a schedule of events, visit their website at ftg.org/. Saturday, January 21st from 2-6pm at Cutler Ridge Park. Cutler Bay will be holding their 8th Annual Chili Cook-Off with prizes awarded for the best chili, salsa, and corn bread in Cutler Bay. There will be chili tastings and entertainment for the whole family. New this year is a golf cart contest. Read the flyer for more information or to register as a chef. Cutler Ridge Park is located at 10100 SW 200th Street(map). Saturday, January 21st. 10am with the event ending at 5pm. An event for car enthusiasts, history buffs, and those who enjoy a leisurely drive through rural South Miami-Dade County. Participants start at Cauley Square, located at US-1 and 224 Street and moves on to other Homestead destinations ending at Schnebly Redlands Winery. The cost is $10.00 per car at the event. For more information, visit redlandriot.com. January 21 - 22nd, from 10am-5pm. Visit Pinecrest Gardens for their Fine Arts Festival. This juried art show features original art from U.S. and international artists. There will be live music, great food, and other activities for the entire family. Admission is free. For more information including overflow parking areas, visit their website. Saturday, January 14th from noon-4pm. Sign up your kids ages 5-14, for dance classes at the South Miami-Dade Cultural Arts Center. The classes being offered include: Beginning Ballet + hip hop (ages 5-7), Beginning Ballet (ages 8-11), and Intermediate Jazz (ages 10-14). These classes are being offered at a reduced prices and are available only to families with financial limitations. Proof of registration in the free/reduced lunch program at the students school is required at registration. Visit smdcac.org/danceclass for more information. January 14th and 15th, from 10am-5pm. Visit the Fruit and Spice Park for this annual festival featuring arts and crafts, tropical plants, delicious food, and childrens activities. Admission is $8.00 for adults, children 11 and under are free. The Fruit and Spice Park is located at 24801 S.W. 187th Avenue, in Homestead. Phone 305-247-5727 or visit their Facebook event page for more information. Sunday, January 15th at 3pm and 7pm. Don't miss the 5th Annual South Florida One-Minute Play Festival at the Deering Estate. Purchase your tickets in advance at deeringestate.org/one-minute-play-festival. Beginning December 27th, your Christmas tree can be recycled into mulch by bringing your tree to one of the county’s trash and recycling centers. Trees must be free of all decorations. The nearest drop-off location for Cutler Bay residents is at 9401 SW 184th Street. Other ways to dispose of your tree is by cutting it into small pieces and placing it in your green waste cart or place it next to the cart by Monday, January 9th. Beginning in early February, the mulch will be available to residents on a first-come, first-served basis. For more information about tree disposal, visit this page on the county's website. January 13th. Gates open at 6:30pm and the movie begins at 8:00pm. It's perfect weather for an outdoor movie and Pinecrest Gardens provides a comfortable venue. Admission is just $5.00 per person. Visit pinecrest-fl.gov for more information and to watch the the movie trailer. December 16th – January 8th. Palmetto Bay is holding a Holiday Carnival with rides, games, food, and fun. The carnival takes place at 9705 E. Hibiscus Street, across from Palmetto Bay's Village Hall. See the flyer for more information. Friday, January 6th, 8pm. Through music, listen to how different composers including Copland, Gershwin, and Dvorak interpret the American landscape, with Orchestra Miami and members of the Greater Miami Youth Symphony. The concert takes place at Pinecrest Gardens, 11000 SW 57th Ave. For ticket information, visit orchestramiami.org. Saturday, January 7th, at 10am, The South Dade Cutural Arts Center will hold a "Florida Grand Opera Family Day. Find out how you can explore the world of opera through the FREE activities taking place by visiting smdcac.org.